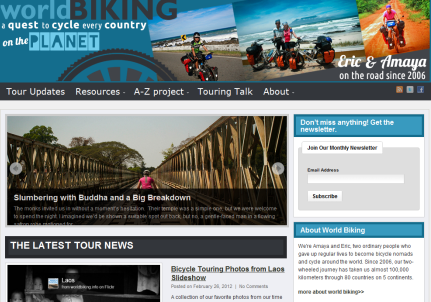 Bike About – Go Bicycle Touring! 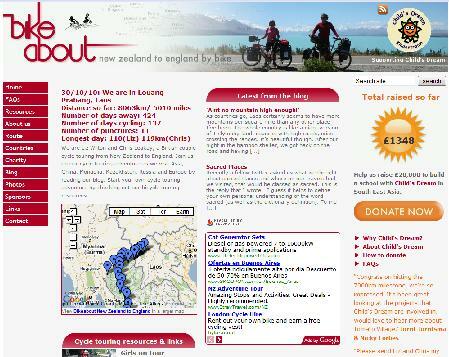 Liz Wilton and Chris Leakey are biking from New Zealand to England, exploring the backroads of China, Mongolia, Kazakhstan and Russia along the way. While this is an increasingly popular route with lots of blogs covering similar rides, this site stands out for its excellent design and useful resources. Everyone seems to want advice on How to Power Gadgets. Liz and Chris have it all figured out with a combination of pedal power and solar energy. In the Resources Section they share technical details and explain their set-up. Another excellent resource is the Girls on Tour section. Here you can read about women cyclists and find tips on practical aspects like choosing a saddle and peeing devices. Great stuff for women on tour. Liz and Chris have even put together a section on Travelling with Kids. They share stories of families on tour and there’s a particularly interesting interview with a family who homeschools. The Bike About team is currently on their way to China. Why not follow along and find out what adventures come their way?